Customers who have submitted residential or commercial plans always want to know more if their plans are rejected. However, if the submitted plans didn’t meet a minimum level of completeness, the Inspection Services Department (ISD) cannot provide detailed rejection comments. 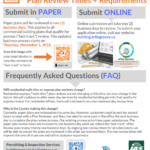 Submitted plans must contain sufficient information for plan reviewers to be able to verify that the proposed construction complies with the Virginia Uniform Statewide Building Code (VUSBC). Please review your plans carefully before submitting a building permit application. Learn more about the Application Revision Process.